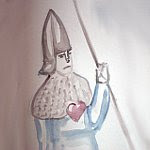 Post subject: Re: The army of Spires; Parriot Skycutter! Love the bird, a very striking colour scheme! 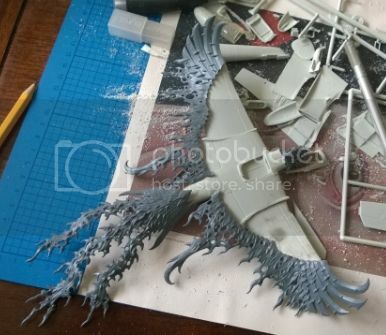 The conversion of an airplane into a phoenix looks...ambitious. Will be keeping an eye on how you deal with it Good luck! Thanks for the encouraging words :S ...[/quote]I thought you deserve a fair warning. It is not going to be easy in any case. It also depends on a the level of detail you want to achieve and methods used. Instant Mold or some other way to make molds for plumage and such may be a good idea. 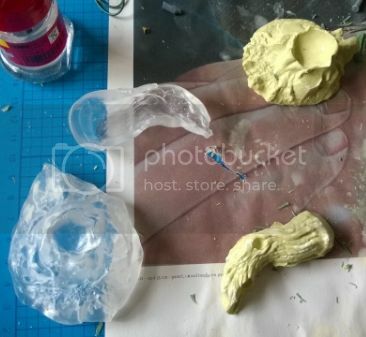 I often see people using a kind of blue putty to temporarily put things together for dry-fitting etc. What is it? I believe it is called Blu Tack and it is a rubbery substance used for putting posters and such in place. I do not know whether the brand is better than other similar products or not. Heat, I've seen people using hor water or salt here, but never tried it on larger pieces so it will be better to consult with someone who actually did. It can also be different for different kinds of plastic. No matter whether this works out or not, I do not doubt you'll know a lot more about modelling than me after this project. I wouldn't say I know what I'm doing... but I have bent plastic parts before. I used a lighter (small candle would work just as well) and sort of waved the part I was bending a few inches over the flame. You have to keep it moving in and out of the heat, bad things happen if it warms up too quickly. Warm up all sides of it then gently warp it how you want, or just a little further as it will likely relax a bit back towards it's previous shape. Let it cool and repeat as needed. That parrot idea is excellent! Well executed! Thanks My first reaction when I found the picture of the bird I posted below was "Cool! that's what I need". My second one was "how on earth am I going to create that, without making it look too cartoony". I glad to hear I managed that. As for the plane to phoenix, here are the first photo's. The first is of what the plane bits actually look like. The second shows roughly what the idea is. @Aicanor: Thanks for the warning. I guessed as much when I came up with the idea. Especially given my very limited sculpting knowledge. Though I doubt that my modelling knowledge will surpass yours after I'm done here. I've seen your everqueen... But this project is just as much for the fun of it and to learn something as it is to actually get a model out of it. Though it is of course great if it works out, if it doesn't then all I've lost is some time and a few spare bits. And if it does work, then I have a few more spare bit and models lying around to chop up. Thanks for the Blu Tack tip. After your post I realised that I have some of the sticking posters to walls stuff lying around, which is white and not blue in my case but does the same thing. So I got that lying around already. Another question. 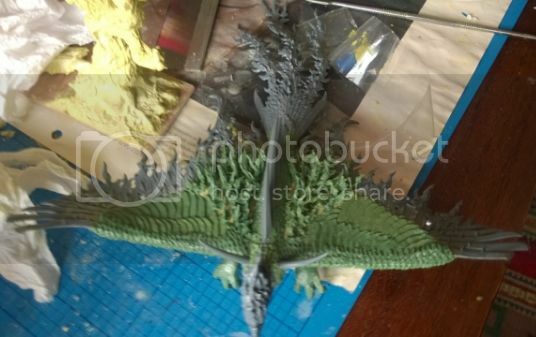 Does anyone have any idea about how much greenstuff will be needed? I need to buy some new stuff, and it comes either in 12'' or 36'' (at least those are the most common quantities). In my experience, a little goes a long way. But I have no idea what will be needed in such a project. So, I'm open to advise. Maybe modelling caly will be cheaper? Something like this. At least you can use it for main body and use green stuff for fine external work. Modelling putty could be actually good for filling up the basic shape, but not every clay is good for modelling minis. Milliput is often used for this together with greenstuf or similar putties. There are some tutorials around which can be helpful. I also think you'll need a way to replicate patterns. Sculpting all those feathers by hand could become quite lengthy and boring work. I still need to try out the Instant Mold. but it looks promising. You'll also need some soft (florist?) wire to keep the putty in the right shape. With the greenstuff, if the larger pack is significantly cheaper, go for it. 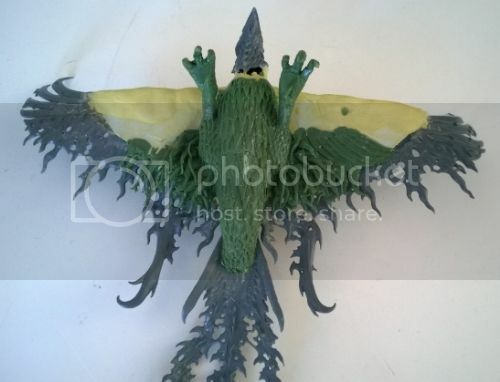 As for the pics, the shape is roughly there, worst part could be the neck. I never tried to work on anything this large, I believe it could beconewuite tricky. With bending plastic, perhaps try to find a few tips on modelling forums first. Open fire always proves tricky to me, but so can salt. Water at least can't be hotter than 100 C. Still, this is one of the things I struggle with. 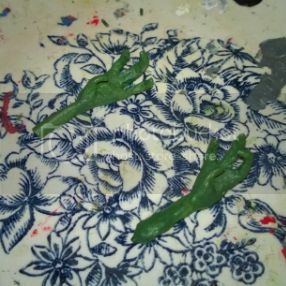 I found some Milliput, greenstuff and an Instant Mold kind of thing. Should arrive today / tomorrow by mail. Thanks for the tip. It does look like the kind of things I will when proceeding. I can use the Milliput for filling out the general shape. Should be good. And the Insta-Mold for batch-generating feathers. I'll have to see what the easiest way to use it here is. 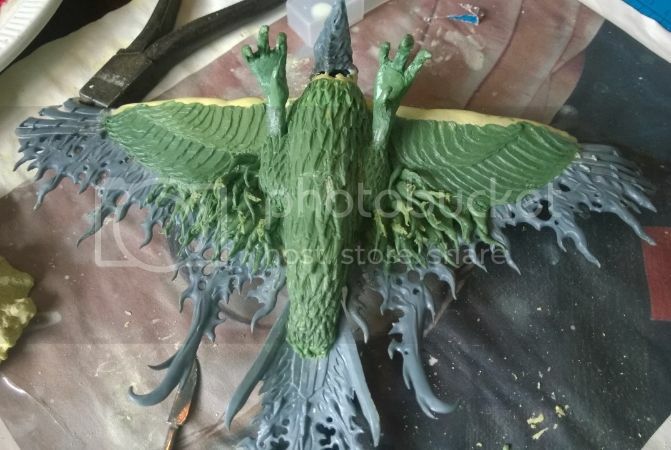 First create a bunch of feathers and then stick them on, or use the mold as a kind of stamp to give the basic shape to greenstuff stuck to the model. It's probably going to end up a bit trial and error. As for wire, I have some metal, coated gardening wire which I can abuse for this purpose. 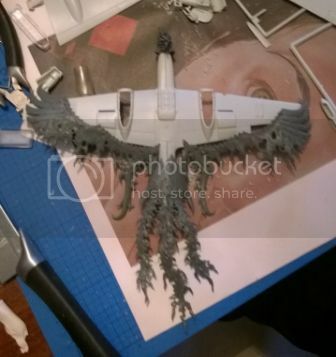 And with all the big Phoenix bits stuck on. After that it's basing of course. No idea as yet about what I'm going to do with that. I have some spare flying stands lying around. But I'm not sure if that's the best idea. 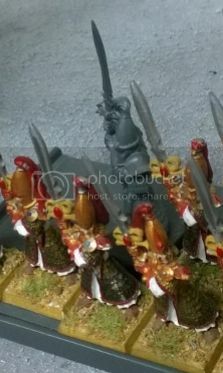 I might borrow Ptolemy's tree-mounted phoenix base. Or do something with more flames. Or both. But that's still a long way away, and I'm open to ideas. Looks good so far. A column with some flames could take care of the lack of claws. It could be too static, but with some angling of the flames on top it could work. 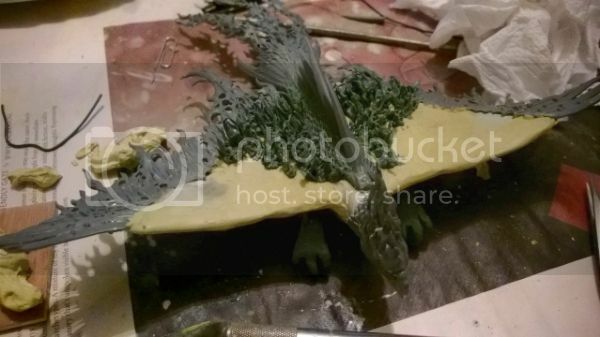 Greenstuff could even be bendy enough to be moulded separately and then glued to the model, you'll need to sculpt some feathers in between molds anyway, but as you say, it is not too difficult. Doing this feather by feather would probably be too much work for worse final result. But I am no expert (the phoenix I sculpted was 'somewhat' smaller. Small update. All the cutting up of parts is done. And I've added milliput putty to define the basic shape. Starting to look like a bird by now. I must say, the milliputty is very interesting stuff to work with. Initially, once mixed, it's a lot softer then regular greenstuff is. And it stays softer for longer as well. This means that it's both easier and harder to work with. It's easier because you have longer to play around with it (in my experience, working with greenstuff becomes tricky after half an hour or so). And it is a lot easier to mold into a rough shape of what you want. But it is harder to get some detail in there (by hand) because it is so soft. It deforms very fast. Another great thing about it is that once set it goes very hard. Harder then greenstuff I think. And it does so faster then greenstuff (surprisingly). In my experience, greenstuff really needs 48 hours before completely set. Milliput does so after 20-ish hours. Making a whole forest with these should potentially be possible. Though I wouldn't know if you actually saved money, considering the cost of material and of course the hassle involved. But for copying bits like this for various purposes it works wonders. I already have a few ideas for terrain projects where having some extra versions of bits would help a lot. So I'll be using this in the future as well I expect. Wow! Looking forward to see that bird progress! That is certainly a mammoth task you've taken on there! Likewise I'm looking forward to seeing how that one pans out. You still not got anything sorted re claws? Any work on this getting done over the weekend Rod? Very much looking forward to seeing how it turns out. While they need some work, they are heading in the right direction I feel. I'm still thinking about the best positioning of them on the model. Great work I can't wait to see more on that bird! 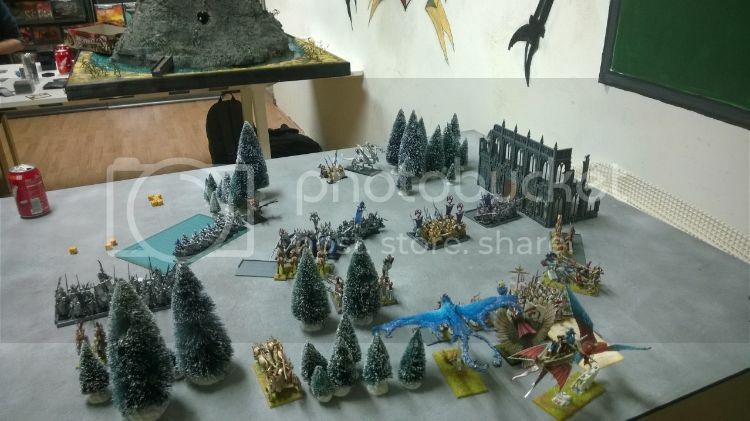 I've found that using a "poke in, drag out" technique works well - it's how I put flames on my dragon's base, and the fleeing empire militia guy! Thanks for those NexS. That was exactly the kind of tips I was looking for. 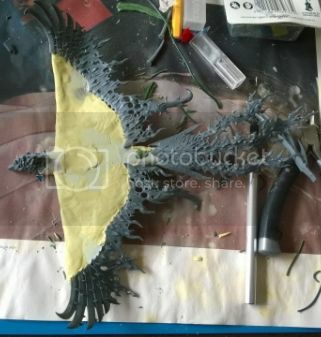 I'll give them a try at some point (when I start work on the top of the phoenix). I'll probably do a few touch-ups on those on the bottom as well, but they are less important. Few people will see them anyway, and I'm guessing a decent paint-job can hide a lot of what's wrong with them... I hope. Where have you hidden the pictures of your dragon? I've had a look in your plog, but couldn't find them there. The bottom part is finished. I'm still not too happy about the flames part, though I think it's good enough for the bottom of the model. For the top they'll need some more work. But the start is there. 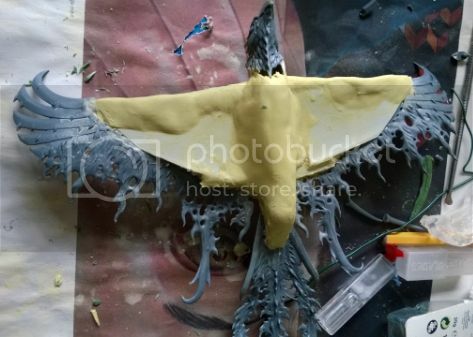 Sculpting the feathers wasn't too hard. And good practice. I'm slowly approaching the point where the greenstuff is actually more or less doing what I want it to do. The trick so far has been more or less to nudge the greenstuff in the right direction, and not so much actually put it in the right spot. Incredible is what I think. 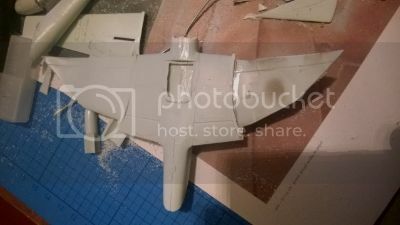 A lot of work on the underside of a model, not many people will see that hard work mate, but I like that you've done it. Another update. Work started on the top. And, as it should be on a phoenix, more flames. These flames I'm a lot more happy with. They look, for want of a better word, more real. At least they match the erratic nature of fire a bit more. So thank you NexS for the tips on sculpting flames you gave. I've also added some spiky bits to the model. You can't go very wrong with spikes after all... Breaks it up a bit. And it puts it apart from a normal flamespire. Picture time. Apologies for the quality of the photo's. It was late last night. No natural light at all and only a phone camera. Comments and critiques, as always, welcome. The phoniex is shaping up very nicely. 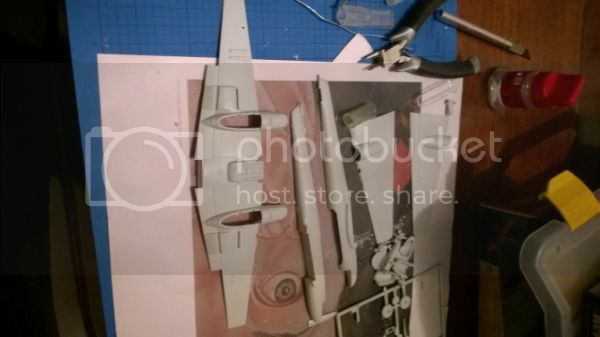 Great idea to use whatever items you might have in order to build a model almost from scratch. Can't wait to see finished sculpt and even more the painted one! Keep up the good work! When I first saw the idea for this project I thought you were mad, but now I know that what I thought was madness is in fact pure genius. Even unfinished, you're pulling this off masterfully! Well, to be honest, I considered the project quite mad as well when I started out. It was mainly a "for fun" project. I had the bits lying around and it gave me something to do in the evening. If it didn't work at all then all it would have cost me was a bit of greenstuff (well, quite a lot actually). And I liked the idea of getting some sculpting experience. I didn't think it would turn out half as well as it did. All that is left to do now is finish the base (part of which you can actually see in the background of these pictures) and get the thing painted. Which will be after my holiday (leaving end of the week...). I'm still in doubt about the colorscheme I should use. 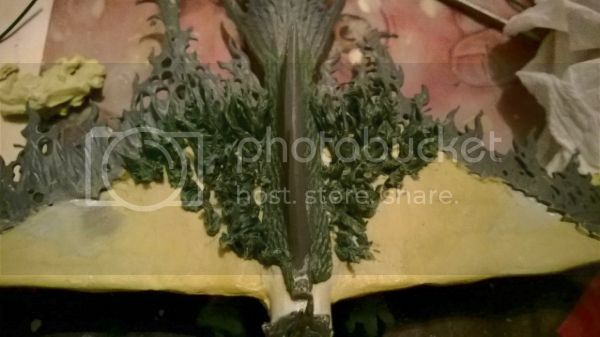 Probably traditional white to yellow flames for the flamy parts. And maybe some orange and black lava-like look for the feathery parts. Not sure yet. So if anyone has got any ideas, please do tell me.